The PcW16 was the last in a series of personal word processing machines from Amstrad, a company based out of the UK. The PCW series, which were first sold in 1985, were sold as single purpose word processing machines targeted at the typewriter market. 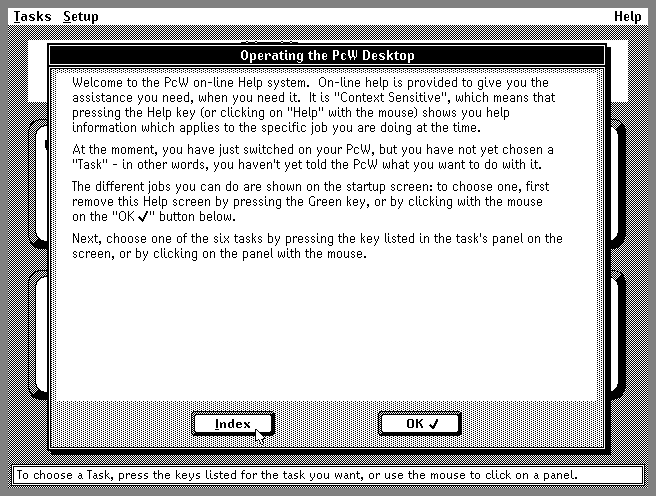 Earlier PCW machines mainly ran a custom operating system / word processing system called Locoscript. 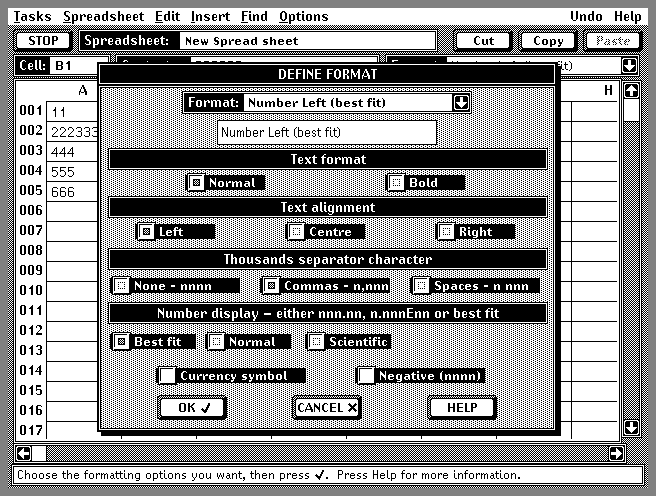 Locoscript was text based but featured drop down menus and was considered much more user friendly than other word processors of the time. The PCW series was based on the Z80 CPU and could also run a number of applications under CP/M (the OS that Microsoft DOS was cloned from). 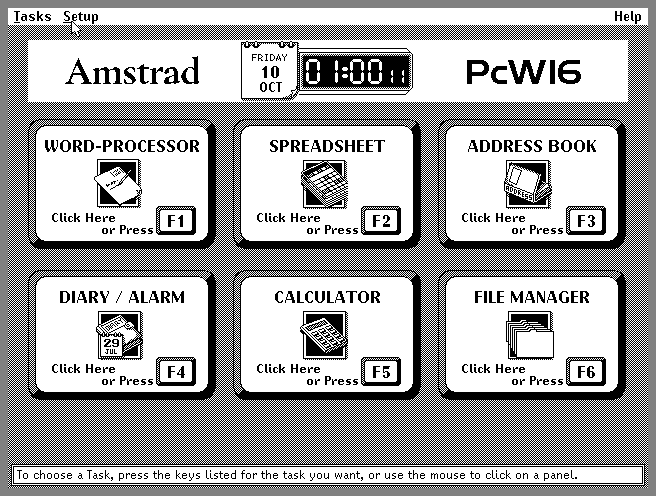 Released in 1995, the PcW16 was a major redesign. The guts of the PcW16 were similar to an IBM-PC compatible, but used a 16 mhz Z80 CPU. Interestingly, instead of using a hard drive, it used 1 megabyte of flash memory to store the operating system and user files. It also included a standard 1.4 meg floppy drive, 1 megabyte of RAM, a monochrome 640*480 display, and a Mouse Systems compatible serial mouse. 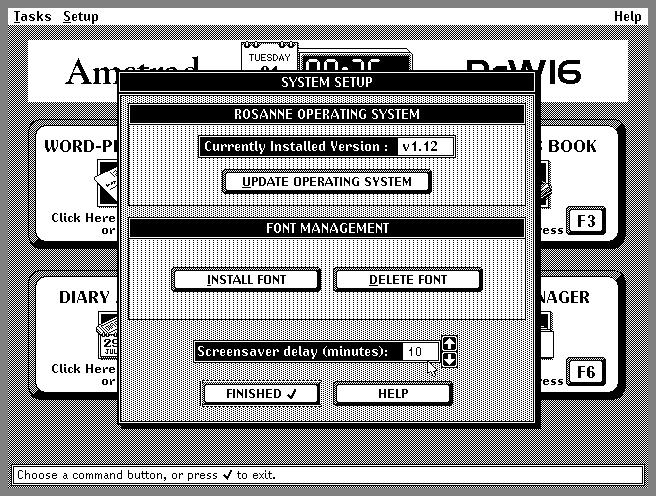 It also included an entirely new operating system and Macintosh-like graphical word processing system called "Rosanne". Like the previous PCW machines, it was targeted at those who would otherwise buy a typewriter or other dedicated word processing equipment. The PcW16 was not very successful for a number of reasons. 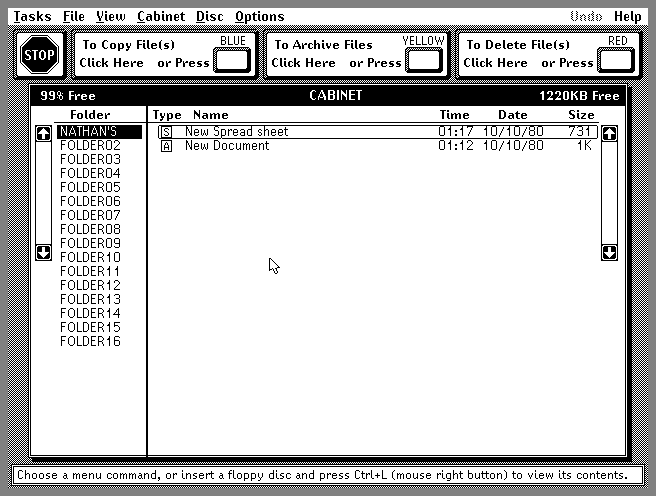 Although it supported importing earlier PCW documents, it was not software compatible with previous PCW machines. This makes the choice of using the 8-bit Z80 CPU even more odd for a machine released in 1995. The Z80 was and still is a powerful 8-bit CPU regularly used in embedded systems, but by 1995 32-bit CPUs were already very common on desktop computers. Also by 1995 demand for Internet connectivity and Web access was taking off. Despite speculation that more software might be forthcoming to add such communication abilities, Amstrad never added to the functionality of the software, and very little third party software was ever written for it. Still, the Rosanne GUI is a good example of a simplified GUI. This is the main screen that appears when the system boots up. You can start one of the predefined tasks by clicking on the button or by pressing the corresponding function key. 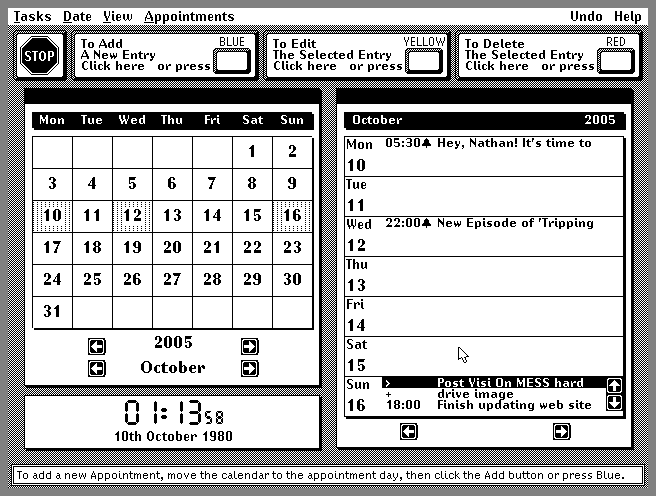 This shows the System Setup window selected from the menu at the top of the screen. It identifies itself as the Rosanne Operating System and that this is version 1.12. It has a built in screen saver that is similar to the Windows "Flying Stars" screen saver. 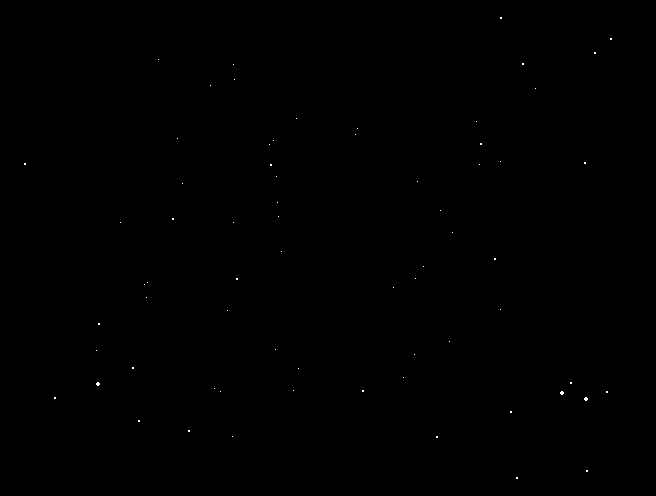 The stars zoom out from the center of the screen like you are traveling through space. 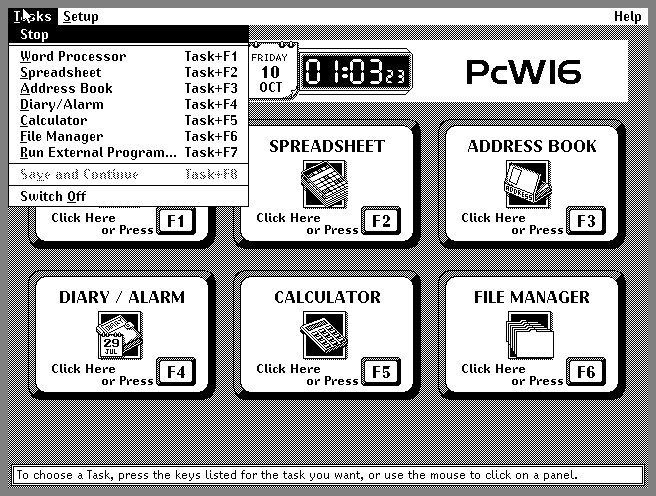 The "Tasks" menu item, comparable to the Apple menu on a Mac, provides an alternative method for starting the applications. However, you can only have one task open at a time. Selecting a new task from within one of the applications automatically saves what you are working on, exits the current application and then starts the selected application. Additionally there is an option to run an external program, however very few ever materialized. 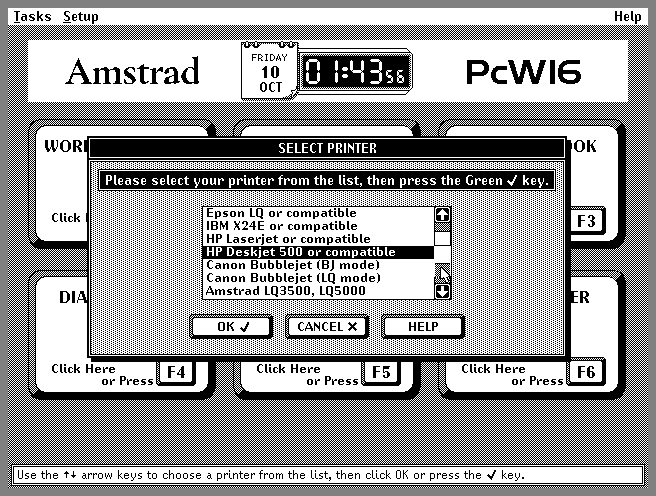 The PcW16 supports a number of different printers that were common at the time. It also includes a simple help system. The is the Word Processor. 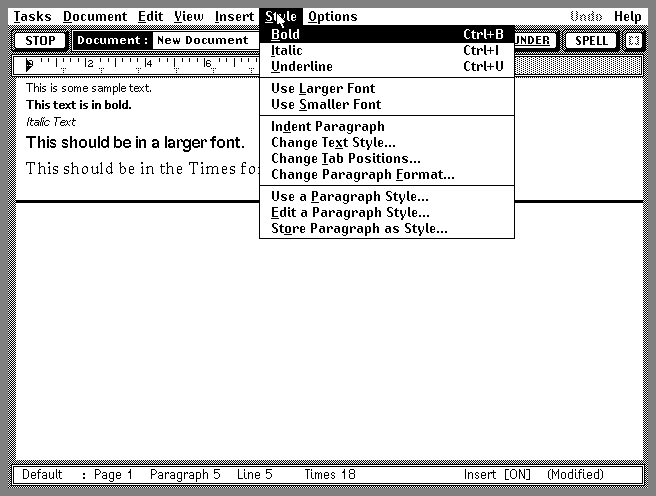 It supports several different fonts and styles and includes a spell checker. This is the Spreadsheet. It is a fairly plain application, it lets you perform various calculations on columns and copy and paste data of various types around as would be expected from any spreadsheet application. 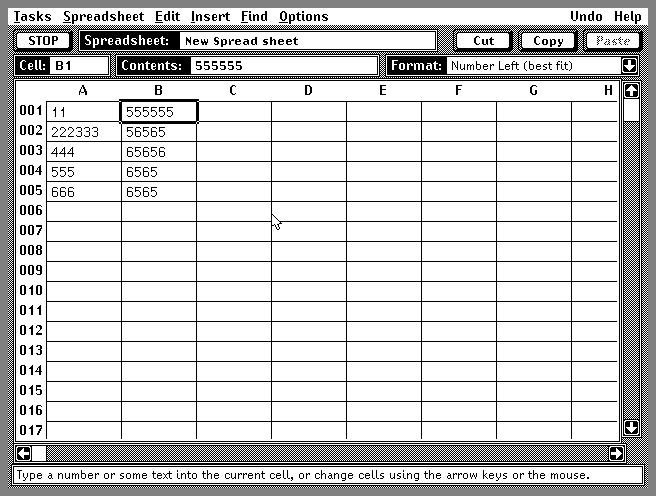 This formatting options dialog shows a number of different visual controls that are used throughout the system. These include option buttons, drop down combo boxes, and text boxes. 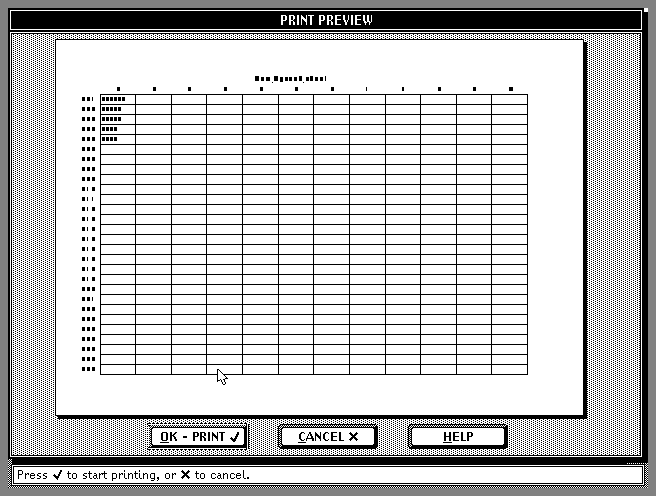 The applications include print preview capability so you can be sure what it is going to look like before you print it. This is the Diary / Alarm. Note how it refers to keyboard keys as "Blue" "Yellow" and "Red". The PcW16 keyboard had a number custom keys marked for common word processing operations, and some of the keys were even different colors. Another interesting feature of the PcW16 is that it is possible to schedule an alert that will "wake up" the computer at a designated time. This is the Address Book. 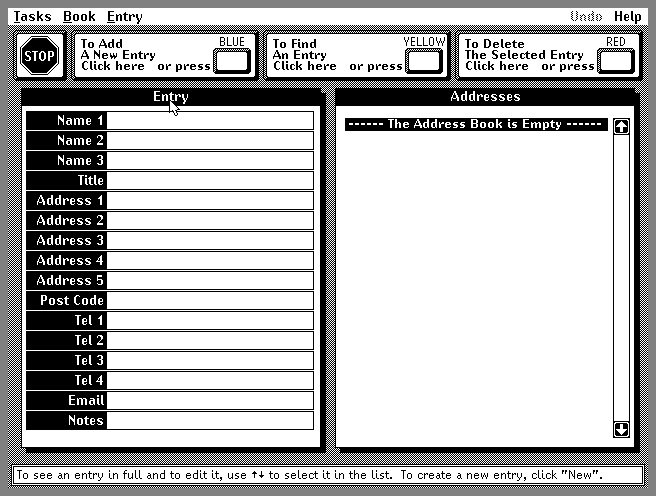 Like any address book it lets you store a list of addresses and contact information. 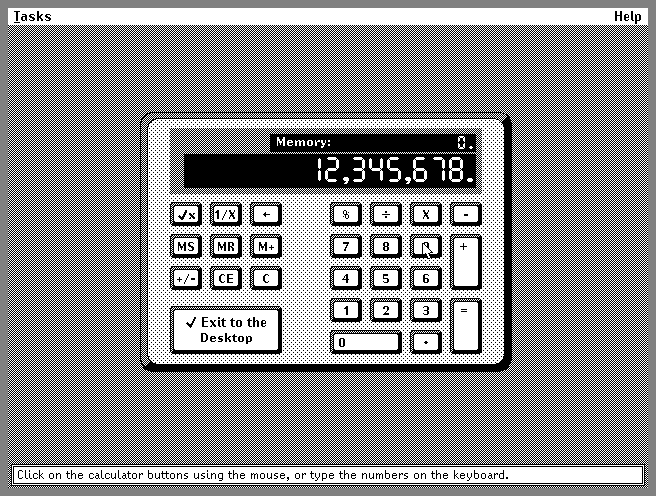 And, of course, it includes a calculator program. This is the File Manager. 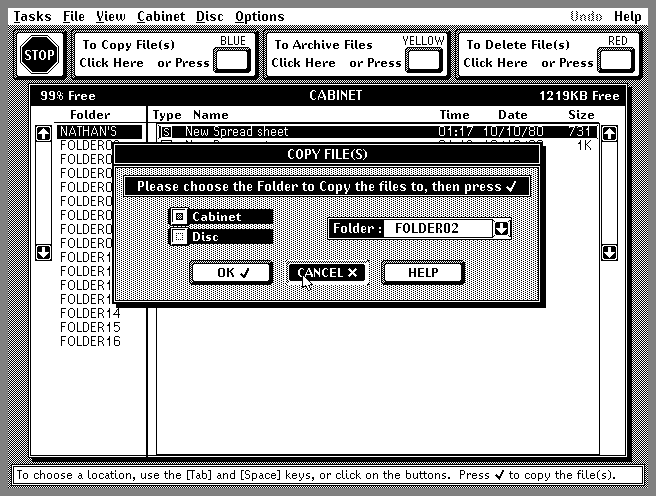 You can store files in one of 16 predefined folders in the "cabinet" on the flash memory, or on a floppy disk. The file management does not use drag-and-drop, but instead uses various menu or key commands to perform file operations. This is an example of copying one file to another location. The PcW16 never completely shuts off. Instead it goes in to a "standby" mode and, as shown here, can wake up automatically to issue an alert scheduled in the Diary / Alarm application.